As well as collaborating with numerous designer brands over the past few years producing sell out collections H&M also work with a selection of charities including WaterAid since 2002 raising money to help projects that support sustainable water resources. Last week they launched a new collection for WaterAid with 25% of the sales price from each item being donated to the charity. The collection features tropical prints with palm trees and bold floral designs which create a relaxed summer look. There's a range of wardrobe staples alongside swimwear, summer skirts and tied tops perfect for your summer holidays. There's also a menswear and children's collection. There's a vintage vibe to the collection with cat eye shaped sunglasses and cropped tops. The swimwear also has a vintage feel with retro cut designs offering a more flattering fit to curvy figures. The floral necklace is an ideal accessory if you want to add a touch of the tropical trend to your outfit without wearing bold printed pieces. Are you a fan of tropical prints? i love this collection and have tried a lot of it on before. hopefully will be able to purchase a less flashy version of the tropical prints through this collection soon! Wow this collection looks amazing! I love the swimsuit in the second photo, so many amazing pieces I want to buy the majority of it :( The prints are amazing, really great for the summer. 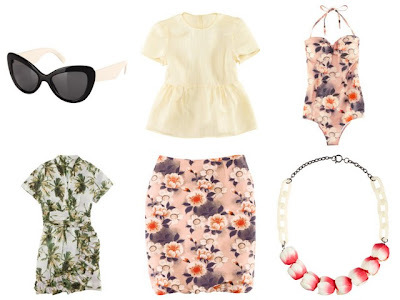 I really want the floral skirt, might have to seek it out today! Cool collection! And for a good cause as well!!! that floral crop top is fab, wish I could pull it off! I love the tropical blouse! It's a great print. Love H&M. They are so on trends. Oooh you know I was looking at this collection + thinking it was SO pretty but I didn't even know it was for such a great cause - makes it even more appeling to me?! Beautiful especially the crop top in the first set if I had the belly that baby would be mine for all summer long. I have never fallen in love with an H&M collection until now. Holy crap, I need EVERY SINGLE ONE OF THESE. Oh wow, it's all so pretty! So in love with the palm print dress!